Since 1987, Stott Chiropractic has been here for you and your family. We want to empower you to proactively take control of your health and wellbeing. Our team welcomes you to our family-orientated practice. We love developing relationships with our patients and making a positive impact on people’s lives! Our Western suburb location is convenient for Sinnamon Park, Jindalee, Westlake and Oxley residents. Our proximity to both the M5 and M7 makes travelling from Kenmore, Chapel Hill, Indooroopilly, and Darra a breeze! Car parking is available on-site. At Stott Chiropractic, we take the time to learn more about you and your concerns. We are here to help you discover a new and improved approach to health. 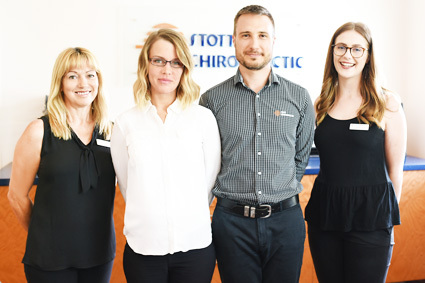 We’re a passionate team of chiropractors and chiropractic assistants who want to help our community achieve better health. We strive to help everyone who walks through our doors gain a new lease on life. Our team is ready to help you. Contact us today to schedule your first visit! We look forward to meeting you.